Because you will remember the loved one with every sunrise and every sunset. Because someone special made your life brighter. 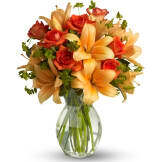 For these reasons and more, this brilliant arrangement will be much appreciated. 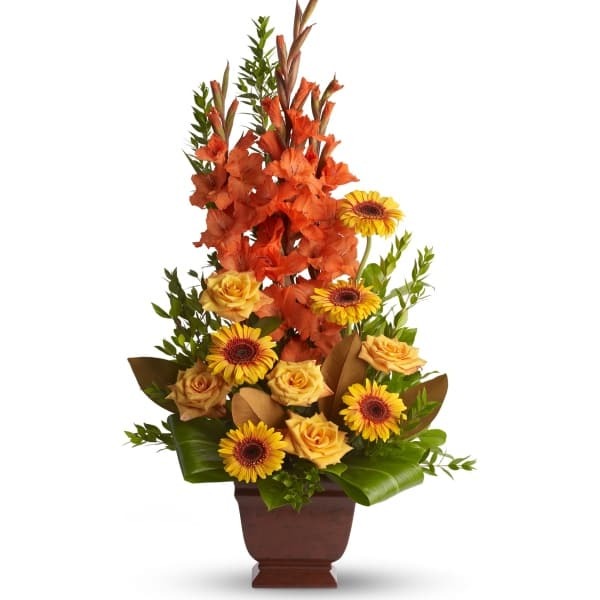 • A lovely assortment of flowers such as fiery orange roses, gerberas and gladioli, ti leaves, magnolia leaves and more are beautifully arranged in an exclusive Noble Heritage urn. • Arrangement measures approximately 20" W X 38" H.
Flowers will be received by a Bradford O'Keefe Funeral Homes' staff. I couldn't believe that the store would be closed on Saturday afternoons. 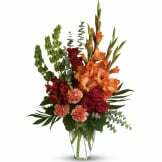 I did not see the flowers we chose as they could not be delivered to the funeral home as they were closed when I ordered them on Saturday and the funeral was Sunday. The store graciously called and suggested we sent them to the family home which we did. We had a note from the family that said they were beautiful. The flowers were outstanding and delivered right on time as I instructed. I am out of town so I am always wary of ordering flowers from a local florist but this was an easy, outstanding purchase. 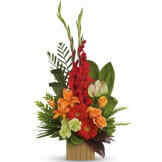 All of our flowers are designed and delivered by hand from a local florist in in Gulfport.